My name is Jacinda and I love to sew, draw and photograph beautiful things. My amazing husband and I are living in Northern California as he completes his internship as a pastor. I aim to create unique personalized drawings that are treasured forever. In my sewing I strive to use upcycled and repurposed fabrics whenever possible and I always enjoy a challenge. 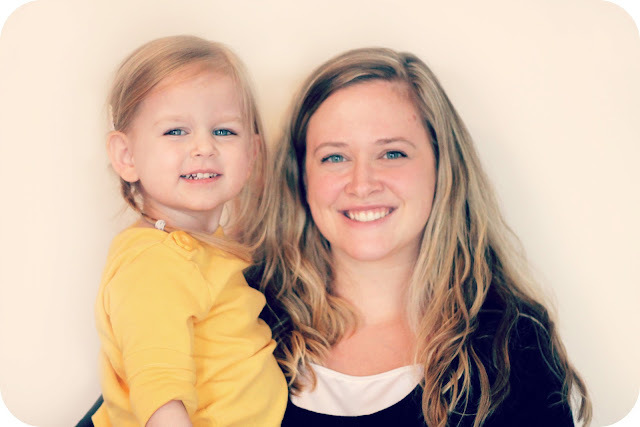 I blog at yellowcloth about my sewing adventures and other artsy crafty pursuits. I invite you to view my portfolio of custom drawings and photography. Prints of photographs are available in shop. Contact me and I will create a listing for you! My name is Kimberly. I'm a young newlywed from Ohio with a love for God, cats, and everything geeky. My blog is a collection of things I find fun and interesting, from DIYs to Doctor Who, all mixed in with random exerpts from my wonderful life. 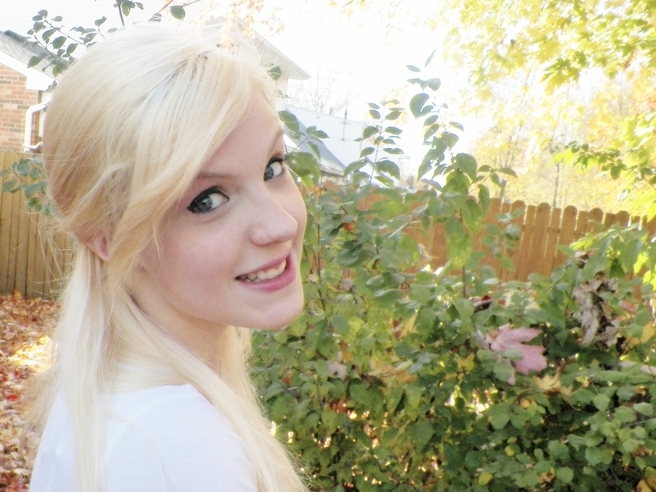 My hair is constantly changing colors and I dream of someday running my own print shop/cupcake bakery. Brickyard Buffalo is a new flash sale website that will be launching soon and you'll definitely want to keep an eye on it. The ladies behind it are working hard to bring you the most unique and on-trend items around at a discounted price. The quantities are limited and each sale will only last a short time so you will definitely want to snag things while they last. Big things are coming! Go subscribe now at www.brickyardbuffalo.com. 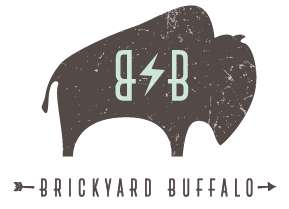 Also, BB is accepting vendor applications - so if you are interested in selling your product on their site, hit them up at vendor@brickyardbuffalo.com. I'm Mary and I am a Christian stay-at-home-mama to our daughter Hailey (with a baby boy on the way). I taught myself to crochet in 2010 and I have loved it more everyday. I also do some knitting but my first love will always be crocheting. My daughter Hailey got me into crocheting hats right off the bat. Now I like to try new and different patterns to improve my skills. I also love working with a lot of different colors and yarn fibers. In my shop you will find goodies for your little ones and for ladies. Get 20% off your purchase using GIVEAWAYJOY20! I adore yellowcloth's monogram illustrations for my home. love love love!!!! I love the Liitle Red Wall Clock from Squack Doodle! love all of these giveaways! i also love that you give us a little info about the ladies... such a personal touch! I love the Cheerfully Charmed Bubble necklaces. I want one in every color! I love the Cheerfully Charmed bib necklaces! I love the green and white earflap hat from fountain top creations! The Fountain Top earwarmer looks perfect for a cold Canadian winter! From yellow cloth, i love the Family Tree Custom Illustration 8x10"
I love the cool weather infinity scarf from Fountain Top Creations! All these giveaways are so cute!! Love the bubble necklaces! 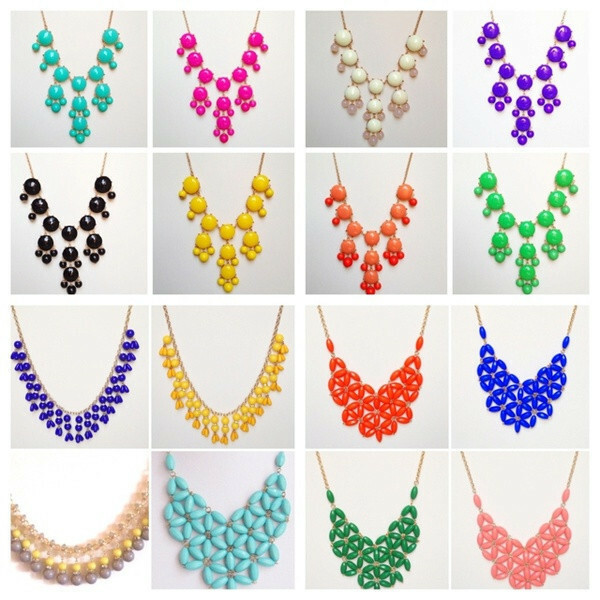 I love the cheerfully charmed bubble necklaces! I especially love the fact that they can make a plain t-shirt and jeans look chic! I already have a few necklaces from Cheerfully Charmed...but I am dying to add a few more to my collection! Everything looks wonderful!! I love the you + me clock!! How cute!! The Cheerfully Charmed necklaces I love also!! I love the turquoise adorned bib necklace from Cheerfully Charmed. I love the hats in Mary's shops! I love the clocks from Buffalo!! Love the ear flap hat. I LOVE that clock and I LOVE Jacinda's drawings. We went to high school together, and she did one for each of my kids. They are such a treasure! i love the clock & baubble necklaces.. so cute! i love the ear warmer from fountain top creations!! love the sock monkey hat from fountain top creations! I really liked the clock. oh my goodness, that sweetheart clock is so cute! i love love love the Cool Weather Infinity Scarf in Forest Green in Fountain Top Creations shop! I adore the statement necklaces! And the scarfs are perfect. I would love one of fountain top's Sweet and Soft Women's Crocheted Ear Warmers!!! I need that crochet ear warmer. The bow is amazing! I am LOVING the bubble necklaces!!! i WANT one! I love the headband from Crocheting The Day Away!! I love the Infinity Scarf from Fountain top Creations. The sweatheart clock is adorable! I want one for everyone I know! I love the Sweet and Soft Women's Crocheted Ear Warmer!!! At cheerfully charmed, loving the yellow bubble necklace! 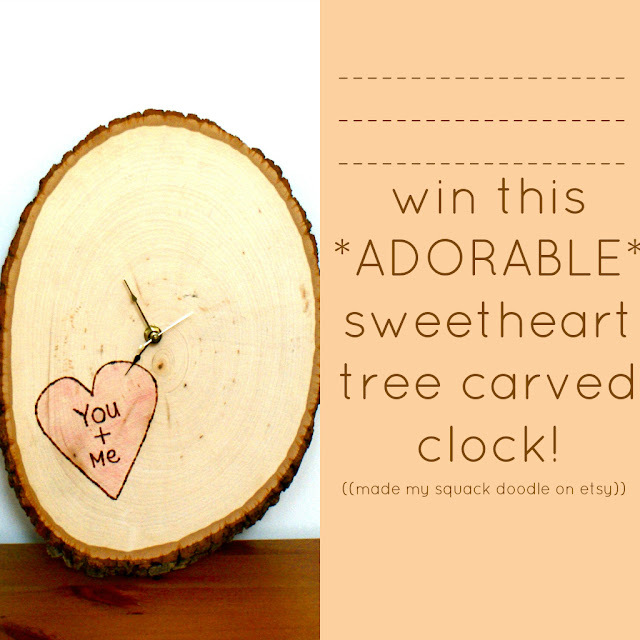 I love the "sweetheart tree carving" clock from Squack Doodle. I think Mary's owl hat is adorable! I love the red bubble necklace and the wood carved wood clock. I love the cheerfully charmed Turquoise Bubble Bib Statement Necklace! I also really like the infinity scarf from fountain top creations! AHHHHH! I can't believe I won!! Thank you so much! Yahoooo~!